Colonel Styers served in the United States Air Force for 26 years retiring in September 1992. 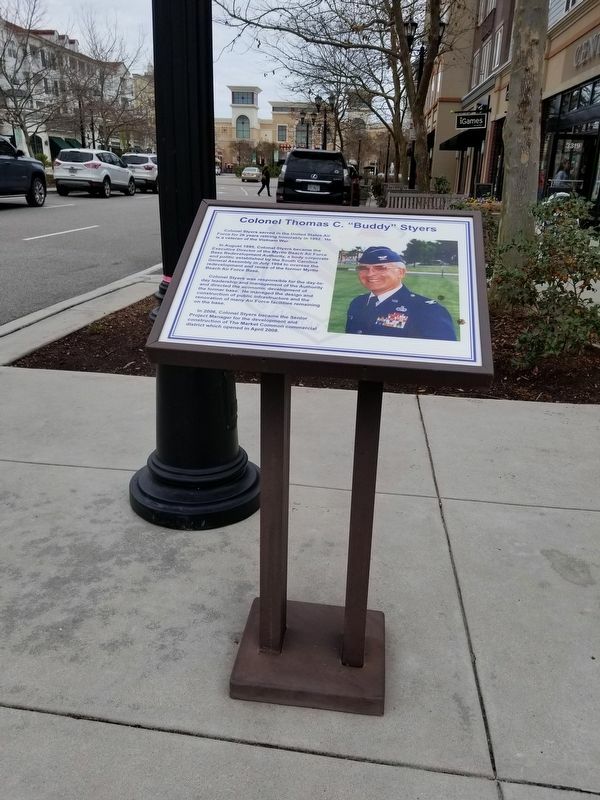 In August 1995, Colonel Styers became the Executive Director of the Myrtle Beach Air Force Base Redevelopment Authority, established by the South Carolina General Assembly in July 1994 to oversee the redevelopment and reuse of the closed federal military installation. 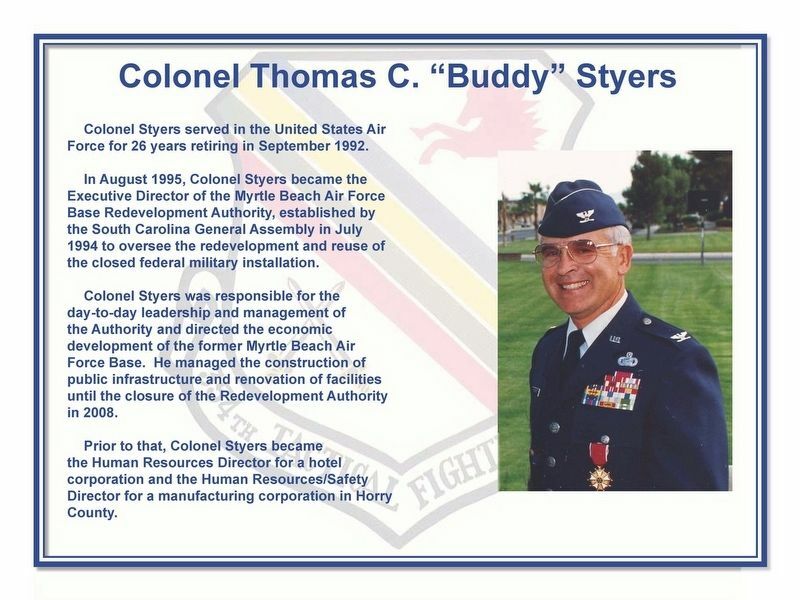 Colonel Styers was responsible for the day-to-day leadership and management of the Authority and directed the economic development of the former Myrtle Beach Air Force Base. He managed the construction of public infrastructure and renovation of facilities until the closure of the Redevelopment Authority in 2008. Prior to that, Colonel Styers became the Human Resources Director for a hotel corporation and the Human Resources/Safety Director for a manufacturing corporation in Horry County. on Styers Way. Touch for map. Marker is in this post office area: Myrtle Beach SC 29577, United States of America. Touch for directions. Other nearby markers. At least 8 other markers are within walking distance of this marker. General Robert H. Reed (within shouting distance of this marker); Chief Master Sergeant Gary J. Moser (within shouting distance of this marker); Brigadier General James Howell Howard (within shouting distance of this marker); Myrtle Beach Air Force Base Redevelopment (about 400 feet away, measured in a direct line); a different marker also named Myrtle Beach Air Force Base Redevelopment (about 400 feet away); Law Center (about 400 feet away); a different marker also named Myrtle Beach Air Force Base Redevelopment (about 500 feet away); Jack Walker (about 500 feet away). Touch for a list and map of all markers in Myrtle Beach. More. Search the internet for Colonel Thomas C. “Buddy” Styers. Credits. This page was last revised on January 29, 2018. This page originally submitted on January 28, 2018, by Charles Keller of Myrtle Beach, South Carolina. This page has been viewed 78 times since then and 4 times this year. Photos: 1, 2. submitted on January 28, 2018, by Charles Keller of Myrtle Beach, South Carolina. • Bernard Fisher was the editor who published this page.